If you ever needed something to remind you that we live in the future, then this video released by Tesla CEO Elon Musk, showing one of the company’s cars driving itself across a city and then parking itself, should do the job just fine. If it doesn’t, then you’re probably reading the wrong page, because we can’t stop watching it on repeat. The video shows what the company’s self-driving technology is capable of after announcing that all new cars built in its factory from here on, including the Model 3, will include upgraded technology required for full autonomous driving. 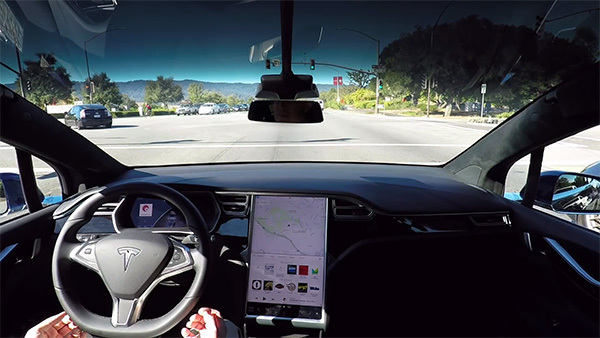 We have seen plenty of videos showing the company’s Autopilot feature in action, but this video of a Tesla driving through traffic all of its own accord using the upgraded Autopilot 2.0 tech is a thing to behold. For those wondering why there’s someone sat in the car that’s driving itself, Tesla had to have a human in attendance should things go wrong in order to comply with current laws. At no point through the video, which also saw the car leaving a garage as well as parking flawlessly, did the person interact with the car, leaving it completely to its own devices. Speaking of parking, did you notice how the car ignored a disabled spot before parking? Musk says the car’s new autonomous driving system reads road signs in order to ensure it’s obeying laws, including making sure it’s parking where it should. When searching for parking, the car reads the signs to see if it is allowed to park there, which is why it skipped the disabled spot. Unfortunately, Elon Musk did have to temper expectations slightly, saying that “it will take us some time to complete the validation of the software and get regulatory approval but the important thing is that the foundation is laid” when speaking of Tesla’s self-driving cars. Regulatory approval or not, though, this stuff works, and if that video is anything to go by, it works surprisingly well. We weren’t kidding. We really do live in the future, and it’s Tesla-shaped. Sounds like your a prime candidate for self driving technology.